In what is a boost for both the team and for French cycling itself, the Cofidis credit-lending company has decided to extend its sponsorship in the sport and will continue to back its team for an additional three years. The sponsorship had initially been scheduled to run until the end of 2013 but will now continue until at least the end of 2016. That will represent a twenty year investment in the squad. Announcing the deal, Thierry Vittu, Human Resources manager of the Groupe Cofidis Participations, said that the team continued to achieve the sponsorship goals, including maintaining and promoting awareness of the company’s services, as well as helping the brand appear more ‘human’. 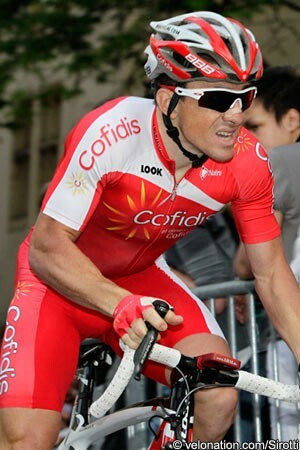 Cofidis has set a target of returning to the WorldTour as being of prime importance, saying that the publicity it gets from the Tour de France is a crucial part of the decision to extend the sponsorship. Currently a Pro Continental team, it has relied on wildcard invites since 2010, when it dropped down from the ProTeam level. The sponsor has said that returning to the top level and thus securing guaranteed participation is a major goal. It said that a budget of €9.5 million plus a four year commitment should enable the team to return to the WorldTour, a goal the sponsor wants to see it achieve. However it remains to be seen if this budget is sufficient. Speaking earlier this year to La Voix du Nord, team manager Eric Boyer said that the squad’s budget of between €8.5 and €9 million made things difficult. "More and more foreign teams are built with a budgets at around 12 million euros. They have great champions, who are expensive,” he said. It is likely that Boyer will seek additional backers to bring the budget to a higher level, but the four year commitment should at least give him some breathing room. The team features a number of strong riders, including four-time Vuelta a Espana mountains winner David Moncoutié, the promising young Estonian Rein Taaramae and the French climber Rémy Di Gregorio. It has clocked up two victories thus far this season, namely Di Gregorio’s stage win in the Vuelta a Astuarias and Samuel Dumoulin’s triumph in the GP d’Ouverture la Marseillaise. The squad was awarded a wildcard to the Tour de France in April, thus continuing a long participation in the race. Boyer has estimated that 80 percent of the return on the sponsor’s investment comes in that event.